Colorful and tasty veggies are now yours, 24/7, from your freezer—thanks to microwave steaming technology from Birds Eye. In front: Broccoli, Carrots, Sugar Snap Peas & Water Chestnuts from the “Mixtures.” At rear, Sweet Peas from the “Selects.” Photography by Claire Freierman. CAPSULE REPORT: Most people we know want to eat healthier and lose weight. Everyone wants to fight childhood obesity. 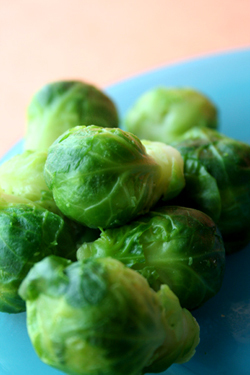 Yet, when you suggest eating lots of healthy, low-calorie, tasty steamed vegetables, there are more excuses than Brussels sprouts. Major manufacturers have listened, and have provided convenient, flavorful solutions for better steamed vegetables, plus fish and other proteins. You now can have delicious, low-calorie veggies in as little as one and a half minutes, for meals or snacking, and entire steamed meals in five to eight minutes. 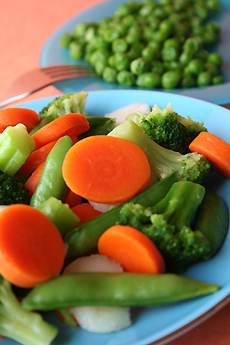 So put that old-fashioned steamer away; here are healthy foods a 10-year-old can prepare. 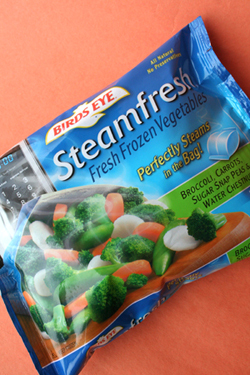 Birds Eye Steamfresh, the first product in our lineup, are frozen vegetables that steam in the microwave (certified kosher). McCormick Veggie Steamers provide seasonings and microwaveable bag units that take the guesswork out of cooking. Just add the specified amount of vegetables or fish and your meal is ready, pronto. Ziploc Zip ‘n Steam bags provide only the bag: Add your own ingredients. The bags are pre-printed with cooking times for standard foods. Glad makes a similar product. More good news: no pots to clean. Full steam ahead! *His initial product was frozen fish; he then developed processes for meat, poultry, fruit and vegetables. In 1929, he sold his company and patents to Goldman Sachs and the Postum Cereal Company, which became General Foods (subsequently merged with Kraft), for $22 million. That’s a huge sum today—imagine it in 1929 dollars! Steamfresh is available in 10 varieties of “Selects” and “Mixtures,” in 12-Ounce Bags that microwave in 4-1/2 to 5-1/2 minutes, plus “Singles” that are ready in a mere 1-2 minutes. Singles, four 3.25-ounce bags to a box, which include Baby Brussels Sprouts, Super Sweet Corn and Sweet Peas. Specially Seasoned, which sound great but we didn’t have a chance to try them, include Asian Medley, Garlic Baby Peas & Mushrooms, Garlic Cauliflower and Southwestern Corn. Place bag in microwave and in 5-1/2 minutes, the delicious veggies in the photo above emerge. available in Singles, individual servings. 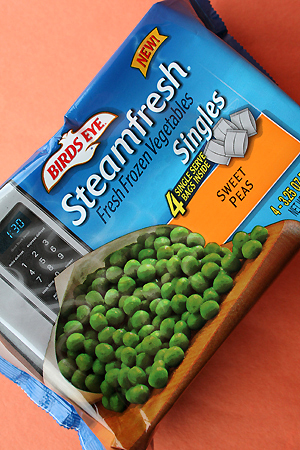 What’s the difference between Steamfresh and putting regular frozen vegetables in a microwaveable dish with some water? Technology. You’ll watch the flat bags inflate like balloons in the microwave; your vegetables are truly being cooked in hot steam, as opposed to the makeshift water-in-a-covered dish process. For the most part, all of the vegetables taste great. We find that frozen broccoli and cauliflower invariably get mushy (and it’s so easy for us to obtain and steam fresh varieties to the al dente texture we prefer). Birds Eye has been sagacious in assembling its selects mixes so that it isn’t a problem with other varieties. Baby Brussels Sprouts are perfectly lovely and sweet, with no trace of bitterness that turn many people away from this vegetable (if you don’t like brussels sprouts, try these). Our mixture of broccoli, carrots, sugar snap peas & water chestnuts was well received, the crunch water chestnuts, crisp carrots and snap peas compensating for the somewhat softer broccoli. On “diet days,” it’s a delight to pull package after package from the freezer and have instant (almost) healthy food. In the middle of a panic snack attack, it’s a relief to be able to grab a package of broccoli or our favorite mix and, in five anticipatory minutes, have a comforting, hot dish of healthy colorful veggies—we can eat the entire bag for 120 or 140 calories, which would buy one average cookie, assuming we ever stopped at one cookie. Also, we would be remiss in not emphasizing that these vegetables taste fine with no embellishment. All of the tasters ate them plain—no salt, no butter, not even a squeeze of lemon (but feel free). There’s no need to do anything but enjoy Steamfresh for the healthy steamed vegetables they are—tasting almost as good as fresh-steamed vegetables, and a heck of a lot easier to prepare. The products are all natural, and preservative free. As with all frozen vegetables, they can be cooked on the stovetop if the microwave goes on the fritz. Available at supermarkets nationwide. Prices and availability are verified at publication but are subject to change.